Ancom's 42" Starter Four Post Steel Shelving by Tennsco with 7 tiers and adjustable dividers is available in dimensions for letter size storage. 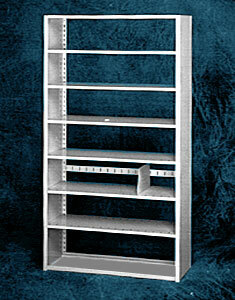 Tennsco starter shelving design consists of uprights, shelf supports, dividers, backstops and shelves. Shelving units are sold in starter and add-on units, which are connected for additional stability. Units have adjustable shelves and dividers. Please indicate cabinet quantity and desired options when ordering.